Kien has tummy time for a couple of minutes every few hours. He can now lift his head up so high, as demonstrated yesterday in this pic. It has been 3 weeks since we started sleep training and I feel like it has consumed me! Kien sleeps very well at night (only waking up for his feeds and goes straight back to sleep), but during the day it is an entirely different story. His naps are brief; that is if I can actually get him down for a nap. My days completely revolve around his sleep routine, and I spend most of that time in the bedroom with the curtains closed, listening to white noise and patting his back. If this isn't a labour of love I don't know what is! His naps are slowly (and I mean very slowly) getting better. Today for one of his naps he actually transitioned himself through to the next sleep cycle. This is only the second time he has done this since we have been sleep training, and the first time was right at the beginning. Lets see how he goes this week - this is the glimmer of hope I have been waiting for. I purchased the miracle wrap on Sunday (a swaddling blanket that resembles a straight jacket) since Kien can Houdini his way out of any swaddle I put him in. It has been a miracle indeed - two nights in a row now he has slept for 4 hours straight, from 11pm to 3am. It is such a luxury for me to be able to sleep for 4 hours solid. On Sunday Kien was the centre of attention when the family came around for a visit. 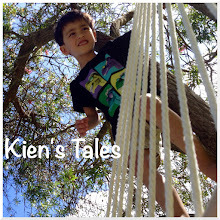 Kien loves to talk! Whenever I read him a story he tries to imitate me. After one of his naps I recorded this clip.